American history did not end with World War II, there were still monumental movements and events that shaped the face of the United States and its people in the latter half of the 20th century and beginning of the 21st. Yet, for all intents and purposes, the last 60-plus years are merely a footnote to the experience known as The American Adventure. Perhaps it is time to revisit our own past and rebuild the story of our people going forward. I understand that a show featuring the entirety of American history would, well, let’s just say guest would still be there long after the park had closed. However, there is a balancing point between detailing the whole story of America and only highlighting a few events from the early eras. 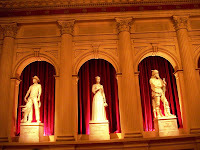 Sure, the moon landing, civil rights movement, and even September 11th are touched upon in the closing montage of The American Adventure, but these events deserve a bit more respect. 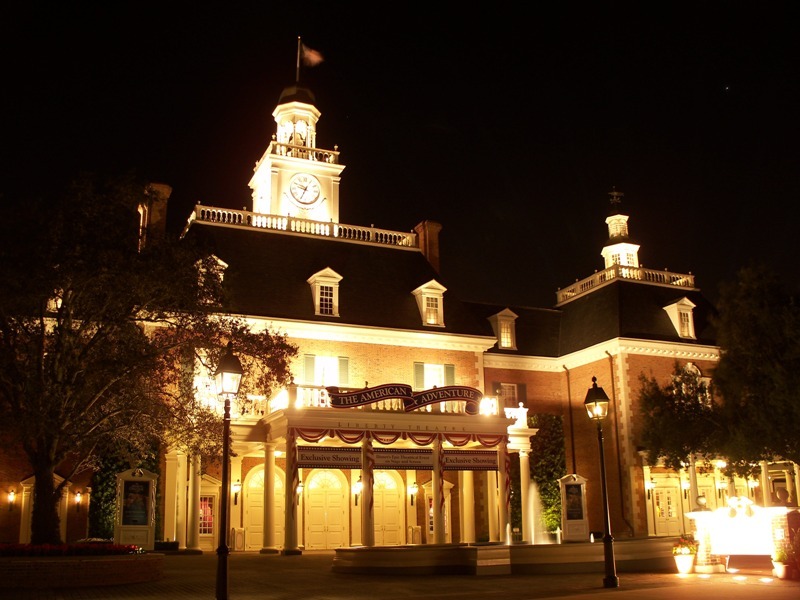 As for thinking about length, The American Adventure is long at twenty-eight and a half minutes, but it isn’t the longest show in Walt Disney World by a long shot. In fact, it isn’t even the longest show in Epcot, which means that there is room to grow the show to a length that can include more of the whole narrative of America. One sticking point of expanding the history of the 20th century is the fact that neither of the hosts, Ben Franklin and Mark Twain, were alive beyond the first decade of the 1900s. 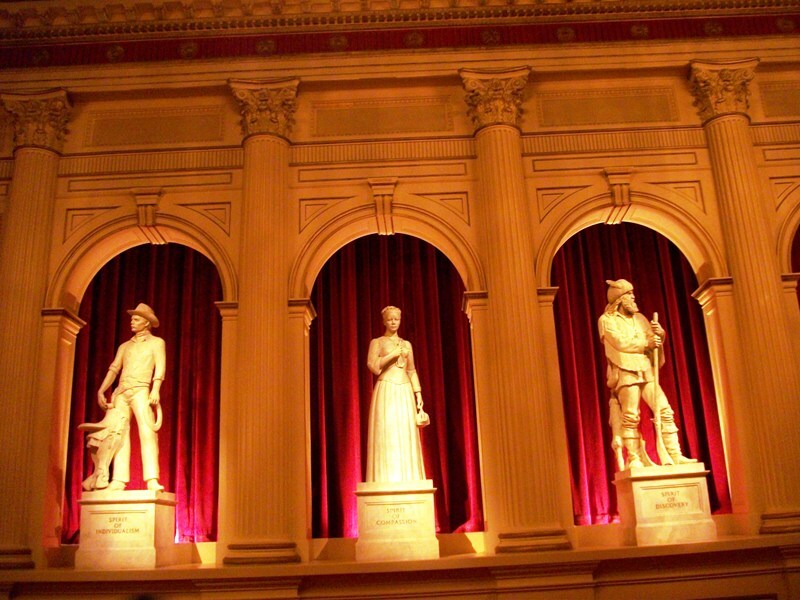 Original concepts for The American Adventure included a third narrator, one relevant to the period, in Will Rogers. While Rogers still appears in the show, his role was greatly diminished. In looking for a host that could easily showcase the last century, an age of news and entertainment, two names immediately come to mind: Walt Disney and Walter Cronkite. Both shepherded the nation through turbulent and ever-evolving times in their own way and would pair well alongside Franklin and Clemens. In the end, however, The American Adventure has never been about the major events in the account of America. Rather, the performance is continually focused on the smaller, critical tales, stories of the regular Americans who were affected by the larger events of the country, and the perspectives of notable figures of the day. Increasing the scope of the chapters in The American Adventure would allow for exploration of the World Fairs by a class of students, the breathless attention to the lunar landing by a child, the balance between war and peace and the generational gap of the Korean and Vietnam conflicts and the transformative nature they had on a family, the cohesion of a nation after an unexpected assault, and any number of other cultural altering events. The American Adventure has always been about the spirit of our nation, the driving determination that sent forth a small band of people to discover a new land, bind together separate states under a common banner, and be able to overcome their faults and flaws to move towards a brighter tomorrow. It is not in the country’s nature to leave something unfinished, which is precisely the reason why it is time to continue the tale of The American Adventure.